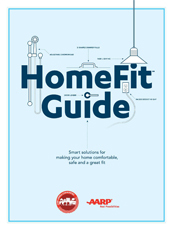 The popular AARP HomeFit Guide has been updated and redesigned. An educational resource and personalized tool kit, the free guide and its accompanying worksheets (see below) help people stay in the homes they love by turning where they live into a "lifelong home." Don't miss the illustrated "Use This, Not That" solutions chart — and the HomeFit video, too. Most existing homes — and this is true whether the home is an apartment, townhouse or stand-alone single-family abode — were not designed as homes for a lifetime. Here, a look at the costs involved in making a home work better for residents and guests of all ages. The new AARP HomeFit series of downloadable worksheets includes a room-by-room assessment survey and templates for "To Do" lists, schedules and taking notes. In places crowded with streets, structures and busy sidewalks, small open spaces (even those as small as a parking spot) can provide lots of room to relax. The founder of ITNAmerica explains how the transportation problems of many older adults could be solved if more people would simply share a ride.